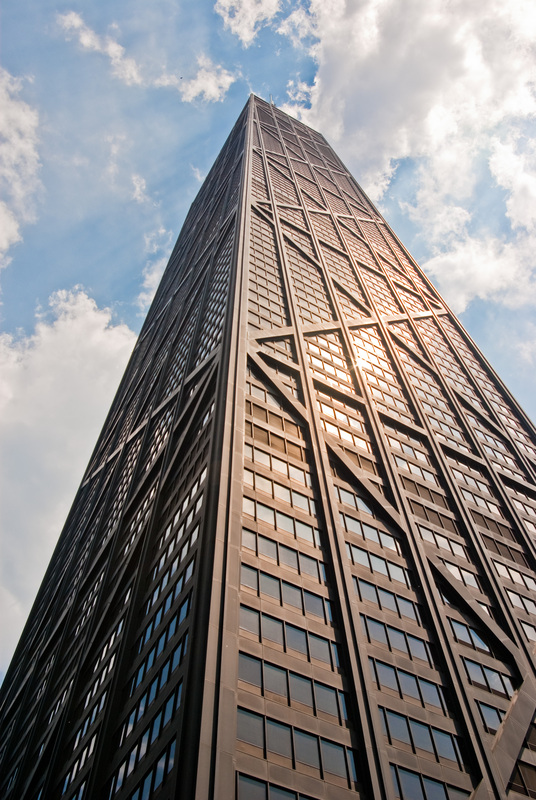 On May 6, 1968, Mayor Richard J. Daley celebrated the completion of the John Hancock Center. Daley used the occasion to glumly describe the American condition as caught “in an atmosphere of gloom… overwhelmed by the magnitude of issues” facing the country. “There is a spirit of pessimism, that social progress is unable to keep step with society,” he said. The Hancock was a remedy. It was a virtue of urbanism, of the promise of The City, of “a society of expanding opportunities.” Chicago offered the Hancock as a symbol, a counterweight to the cultural implosions that were casting away an old era for new—and had yet to reach their apex. For a moment there, the Hancock, heavy with its own symbolic weight, was a sign of things to come. Its strong bracing “Xs” may have been fused together to form a luxury good but they looked forged in and of a place. The structure embodied American might, yet also portended the economic restructuring that would eventually soften muscle into money. In that way, Daley was right. The Hancock was a marker of a coming, new society. Fifty years on, Daley’s words seem, sadly, just as timely. And in all corners of the city, there are projects that can, like the Hancock once did, be offered up as reflections of what our cultural values are and are becoming. Here are but a few of the best. Industry loves a sink. In the days of the city’s heavy industrial production, that sink was wherever was most convenient. (And still is for some communities.) In the South Deering neighborhood on the Southeast Side, the site of a former slag dumping ground is finding new utility as a reclaimed recreational vehicle. Big Marsh is a 278-acre park that will restore the site’s natural hemi-marsh, marrying wildlife and landscape restoration with passive and active recreational opportunities, the latter namely consisting of a cyclocross bike park. The project is driven from the same impulse to repurpose industrial landscapes that led to the development of The 606 or Riverwalk, but the scale and scope of Big Marsh set it apart. Although the bike park will host events and is certain to be a main draw, the spirit of the park rests in a restorative land ethic, more akin to Frank and Deborah Popper’s “Buffalo Commons” proposal to return a significant chunk of the Great Plains back to prairie. The circa-1890s Romanesque Revival landmark, designed by Faber and Pagels, is perhaps Pilsen’s most recognizable building. After decades of semi-use and soft neglect, it was reopened to much fanfare in 2013 after being acquired and redeveloped by owners Bruce Finkelman and Craig Golden. The rehab, led by architecture firm K2, is meticulous and exacting, exposing and accentuating the original details throughout the theater and the first-floor restaurant, Dusek’s, without being overwrought. Yet behind its inherent beauty is a bland affect that permeates place everywhere. You can feel it rubbing up against you from the exposed brick walls, lambently shining down on you from carbon filament bulbs and through the perfectly haphazard décor. It’s a sort of “curried florette” and “cheek jowl” pre-distressed design served on trenchers everywhere from Greenpoint to St. Louis. Thalia Hall is a lovely place to be, to eat, to see a show. But in an era of self-referential historicity, where authenticity is traded as an aesthetic commodity, it feels as real as the mall, and as significant as a Tuesday. On Argyle Street, long the core of the city’s Vietnamese neighborhood, a concept uncommon to American cities is coming: the shared street. Modeled off of the Dutch concept of the woonerf, the designs for Argyle give equal priority to cars, bicycles and pedestrians. The level of the street was raised, curbs have been eliminated and sidewalk capacity has been expanded, allowing storefronts, which mainly consist of Vietnamese bakeries, hotpot and pho eateries, to spill out onto the street. The project provides the environment to capture two emergent trends: that people are now spending more money on dining out than in, and that quietly, but surprisingly quickly, cars are losing preeminence as the only beneficiaries of street design. More than ten years have passed since Soldier Field’s postmodern pastiche makeover. “A giant spaceship just crashed into the lakefront,” Blair Kamin observed. Soldier Field has since settled nicely, at times taking on an almost elegiac quality for when sleekness implied a high-tech promise at a better good. Its almost expressionless glass massing—save for the way it curls as it rises above its historic neoclassical colonnades—foresaw the current preponderance of glass-sheathed nothingness that is a hallmark of Global City architecture. Like Daniel Libeskind’s addition to the Royal Ontario Museum, what once seemed daring and jarring, to juxtapose history with jagged contemporary elements, now feels expected. If Thalia Hall traffics in the selling of history as an aesthetic, Soldier Field remixed history like a sepia-toned Instagram filter, before there was Instagram. Soldier Field is a spectacle, and like the New York Times’ architecture critic Muschamp thought it would, it works. But just ten-plus or so years post its completion, it looks like a Motorola flip phone desperate to break out of a shatterproof Doric case. What it tells us about our particular moment is that time is expensive, flat and fleeting.